As a kid, my number one favorite meal was Kraft macaroni and cheese with a cut up hot dog mixed in. I'd like to think my taste buds have grown up along with my developing a preference for food made from things that exist in nature. Truthfully, there is something about those nitrate-laden processed meat tubes that I still long for when grill season rolls around. Fortunately, there is very little about proper hot dogs that resembles animal flesh, so replicating them as a vegetarian turns out to be quite easy. There are plenty of packaged veggie dog products out there (Lightlife and Tofurky make them), but the store brand veggie dogs often seem nearly as processed as regular hot dogs, just without the meat. So I set out to make my own. In my search, I discovered that carrot hot dogs are currently a thing. That's a bit much to fathom, even for carrot-loving me. Anyone tried it? Then I came across recipes for using vital wheat gluten to make a seitan hot dog. I'd purchased, eaten and enjoyed seitan products before (especially those from Upton's Naturals), but had never considered making my own. Mostly because I didn't really know how to make seitan or how to cook with vital wheat gluten. 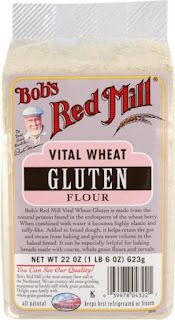 Vital wheat gluten might be tricky to find in some grocery stores, but it's sold in natural foods stores (I bought Bob's Red Mill brand at Whole Foods) alongside the baking flours. 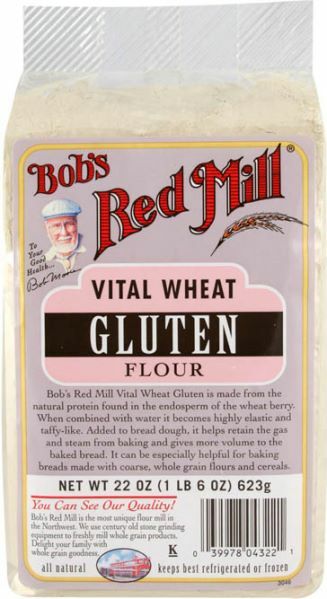 Although technically not a flour itself, vital wheat gluten is made from the protein found in the endosperm of the wheat berry, which is very high in protein. Sorry gluten-free folks...seitan is your enemy. It's like a super flour with a lot of protein and very little starch. When mixed with water, it expands and becomes highly elastic. Plain seitan has a neutral flavor and a slightly rubbery texture, but it takes on the flavor of whatever spices you enhance it with and can be manipulated pretty easily to become chewy without being rubbery. Vital wheat gluten was surprisingly easy to work with. I feared my hot dogs would fall apart on the grill or, worse yet, be incredibly mushy. Instead, the elasticity of the gluten meant it was no trouble to shape the seitan loaf into tubes and steam them. And I think they tasted pretty darn good. Vegan. Definitely NOT gluten free. Heat a small-non stick skillet. Pulse onion and garlic in food processor until finely chopped, then add to skillet and cook until onion is soft, about 3-4 minutes. Transfer mixture back to food processor. Add pinto beans, water, soy sauce, tomato paste, paprika, coriander, mustard, salt, pepper, and liquid smoke to food processor. Process until you have a smooth, thin paste. Combine gluten, oatmeal, yeast, and flax in a large mixing bowl. Pour in the contents of the food processor and stir until combined. If the mixture seems too dry, you can add water by the tablespoon. Knead until a heavy gluten "dough" forms. Place a steamer in a pot of water and bring water to a boil. Cut 8 6-inch pieces of foil. Divide gluten dough into 8 pieces. Roll a piece of dough between your palms into a tube, then place it on a foil wrapper and roll securely, twisting the ends of the foil to close up. Once it's wrapped, you can roll it back and forth a few times on the counter top to make an even, cylindrical "hot dog" shape. Repeat with remaining dough to form 8 hot dogs. Place all dogs in the steamer, cover, and steam for 45 minutes. Remove from heat and allow to cool before unwrapping. Steamed dogs can be stored for a few days in a sealed container in the fridge. Throw them on the grill to heat up when you're ready to eat. Serve with all of the typical hot dog accoutrements. *Both smoky ingredients are totally optional, but definitely help the dogs taste smoky and, for lack of better descriptor, hot doggy. I used Colgin liquid smoke, which can be found in the spice aisle. Here are some less appetizing pictures of the "dough" and hot dog rolling process. I swear it tastes way better than it looks. If you try it out, let me know what you think! Anyone else have favorite veggie dog recipes? I'm going for it - thanks for posting!